In April 2017, the Asbury Park Music + Film Festival brought together 20+ musicians who had played Asbury Park’s legendary club the Upstage for a reunion jam. During that event, Asbury Park Music Foundation had a guitar signed by the musicians, which was auctioned off a year later. 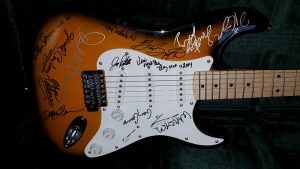 The guitar included autographs from Bruce Springsteen, Steven Van Zandt, Southside Johnny Lyon & Members of E-Street Band. 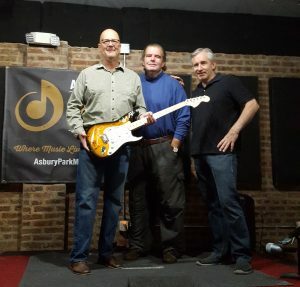 The auction attracted bids from around the nation but in the end the guitar was awarded to, Eric Ellefsen, a new member of the Asbury Park community. Eric’s donation of $5,250 will support our Music Saved My Life youth music programs. 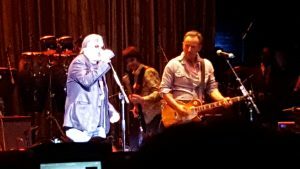 The 2017 Upstage Jam followed a rough cut showing of Tom Jones’ movie “Before the Dawn.” The movie has since been recut to include an interview with Bruce Springsteen as well as footage from the jam session. During the jam session, former E-Street band member David Sancious played the guitar that was autographed and auctioned. The movie is scheduled for release later in 2018 so stay tuned for that announcement. Auction winner Eric Ellefsen recently acquired a part-time residence within blocks of the Paramount Theater where the show was so the guitar will remain in the area. He learned of the auction on the final day and made sure he had the winning bid. We are fortunate to have him as part of our musical community and owner of this historical item.